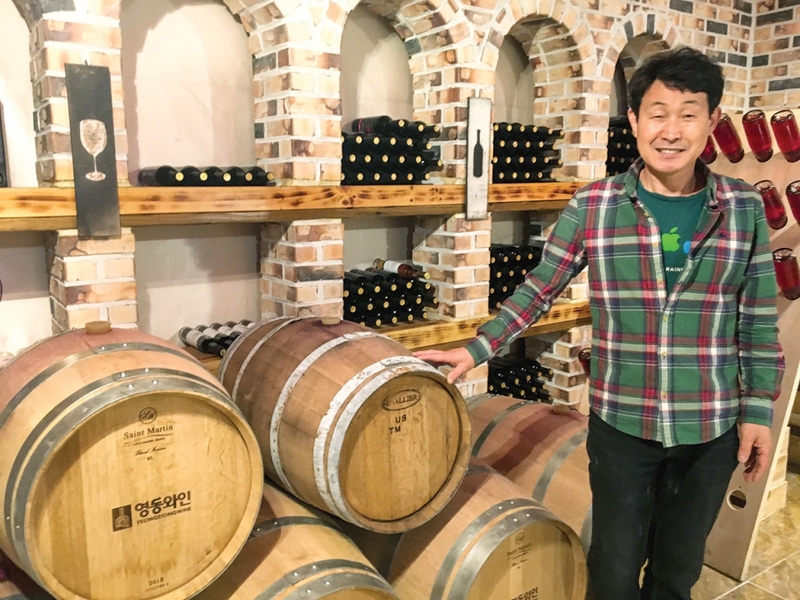 When Ahn Nam Lak decided it was time to return to his hometown of Yeongdong, Chungcheongbuk-do, pretty much smack dab in the center of the country, he looked around and decided he would make wine. It was 2000. Table grapes were already being grown in the region, why not try making wine? Ahn is the owner and winemaker of Chateau MiSo Wine, so named because it aspires to accompany life’s happiest moments. (Miso is the Romanization of the Korean word for smile.) He planted both table grape vines and traditional vitis vinifera wine grapes: Cabernet Sauvignon, Merlot and Chardonnay. The wine grapes died; the climate was too humid, the soils too fertile. The table grapes, however, thrived, and he continued testing out different methods to coax the grapes into wine, learning from each harvest, each winemaking attempt. 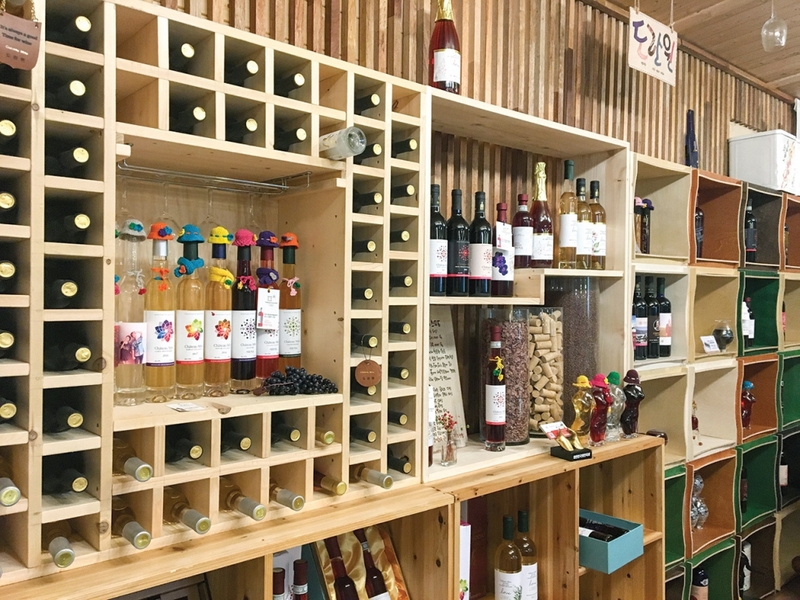 Five years later, Yeongdong County was designated Korea’s Special District for Grapes and Wine, with many trying their hand at turning the eating grapes into a more profitable beverage with an oversupply of grapes. Three years after that, winemaking courses started being offered at the local university and Ahn added some formal education to his accumulating knowledge of viticulture and winemaking. Finally, in 2009, Ahn was ready to start selling his wines, all made from grapes grown in Korea. Today, he has an annual production of 30,000 bottles, with 40 percent of the wines made from grapes grown in his own vineyards. “There are people who don’t know we make wine here in Korea,” says Ahn. I only stumbled upon this fact after coming across his booth at last year’s Daejeon International Wine Fair, where in addition to the wines we are all more familiar with, I tasted wines from regions not traditionally known for wine, such as India, Japan and of course, Korea. Today, there are about 40 wineries making wine from grapes in Yeongdong, and another 20 further south in Gyeongsangbuk-do in Yeongcheon. Wine Korea, a destination winery with a variety of facilities — wine footbaths, two restaurants, underground wine display, wine shop — and the producer of the wine Chateau Mani, named after a mountain in the area, is the largest by far, while the rest are small and reflect the small, fledgling industry. Campbell Early, the sweet, blue-black grapes you’ll find in grocery stores, is the most widely used grape to make red wine — both sweet and dry — and increasingly, rosés, at most wineries. To make Chateau MiSo Premium Dry Red (KRW 40,000, 750ml), Ahn freezes the grape juice after crushing the grapes, them removes the ice to concentrate the flavors before fermenting. It’s an unusual method when compared to Western winemaking techniques, but one that works. The wine is a ruby color with sweet boysenberry aromas. It is dry and rounded with red berry flavors and a refreshing acidity. I couldn’t help but think this is the wine that would pair well with Korean food, a cuisine that is generally very difficult to pair with wine. Ahn uses the same freezing technique to make a dessert wine, a sweet ice wine (KRW 40,000, 375ml), also made from the same grape, which won the Asian Wine Trophy Gold at last year’s Daejeon International Wine Fair. His white wine, made from Muscat Bailey A, a grape used to make wine in Japan as well, is the most reminiscent of wines we already know, with the characteristic grape flavors and aromas showing through. This is a medium sweet wine and would also pair well with Korean food. But it’s his sweet rosé (KRW 35,000, 750ml) made with 100 percent Campbell Early that I think will appeal most to both Korean and non-Korean palates. It is a bright cranberry-colored wine with aromas of candy and bramble and, while sweet on the palate, is also accompanied by tannins. Ahn says he was the first in the area to make a rosé. He is constantly learning and applying that new knowledge to his wines. Downstairs in his cellar, among the French and American oak barrels used to mature his red wines, is a barrel he had custom made from local Korean oak. He’s also trying out local bamboo. I spot the familiar wooden board where bottles of sparkling wine are eventually held upside down, after a secondary fermentation, when made by the traditional method, better known as the Champagne method. Though the bottles hadn’t fully completed their process from grape to sparkling wine, he opens up a bottle for me to taste. Made from Campbell Early as well, it is a dark strawberry colour, with fine and persistent bubbles. I can’t help but smile as per the mission of the winery. It’s nice to see a local wine grower and producer put so much effort into his craft — and then be able to take pleasure in the results. Train to Yeongdong Station or bus to Yeondong Station from Dong Seoul Bus Terminal. Taxi from either station to the festival grounds. What to expect: Grape picking, grape stomping, wine foot baths, grape bingsu (shaved ice dessert) making and experiential activities for children. Wines and other local products on sale. What to expect: A great opportunity to try wines from non-traditional wine making countries, as well wines from traditional wine regions. Wines are sold through Shinsagae as well as online through Kakao and Naver. Winery visits are welcome. For those who do not speak Korean, the best way to visit is through the Wine Train, which includes visits to a handful of wineries including Chateau MiSo and Wine Korea. Call the 1330 Korea Travel Hotline. Winery visits are also welcome.